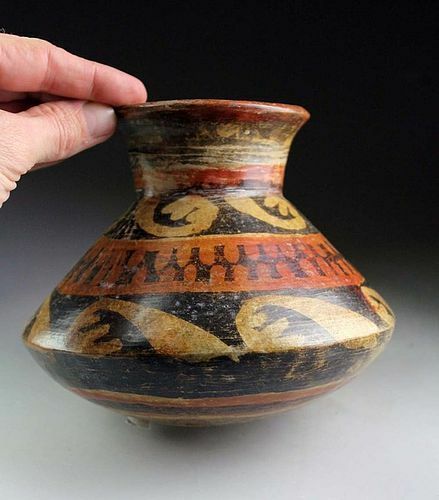 Wonderful intact Pre-columbian Narino pottery Olla! NARINO OLLA / POT. Columbia, Capuli Complex, 850-1250 AD. A rare vessel with a globular body fully decorated with finely preserved pattern in red, black and cream. Condition: Superb! - Excellent vessel, completely intact. From the shaft tombs of the Southern Highland Narino Region of Columbia. This spectacular bowl has the body decorated with a black and red-on-cream resist painted pattern. The inside is beautifully decorated with a resist and red design of monkeys and birds. Size: ca. 21,5 cm. in diameter and ca. 9 cm. high. A fully glazed Chinese Ming Dynasty tomb pottery horse with groom! A very high quality tomb pottery horse with groom, Chinese Ming Dynasty, 1368-1644 AD. The figure is completely intact and with a typical small flaw from the firing on the back of horse. Terrific glazing and fine details, warm colours, perhaps the finest we've seen of the scarce type. Size: 18 cm. wide, 14,1 cm. high. A finely modelled and rare pottery Ram with Straw-glaze, late 6th.-Early 7th. century AD. A beautiful naturalistic pottery Ram in white clay with straw-glaze. Quite Scarcely seen from this Dynasty and in perfect condtiion. Ex. Old Danish Private Collection, bought in the 1990s at Copenhagen dealer. A choice Islamic Nishapur pottery bowl, 10th-12th cent. AD! Islamic pottery bowl, Ancient Near East, ca. 1100-1200 AD. A choice bowl with beige glaze, with brown caligraphic decoration in the center of the bowl and a line on the rim. Narrow base and low walls. Attractive in hand. Size: 126 x 56 mm. Condition: Choice, some restoration typical for these types with mending and some repainting of joint areas. Rare Pre-Columbian pottery shaman figure, likely Colima! The figure clad in animal skins, looks like he is saying a prayer to the gods. Condition: Choice, a few tiny closed hairlines, but looks intact. A large and almost superb pottery figure for the rare type, Likely Central Mexico, 500 BC-500 AD. Impressive figure of a seated male with adorned headdress, holding something in his hand. Grey-brown pottery. Condition: Choice for type, tiny loss at one leg, othervise superb. Pre-columbian Moche figural pottery vessel in parrot form! 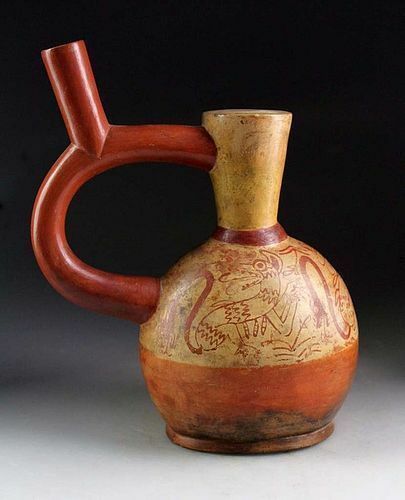 Interesting and rare figural vessel, in the shape of a Parrot, Moche Culture, Pre-columbian Peru, 100-500 AD. The vessel finely moulded with a good expression. Size: 19,5 cm. wide and 15,5 cm. high. 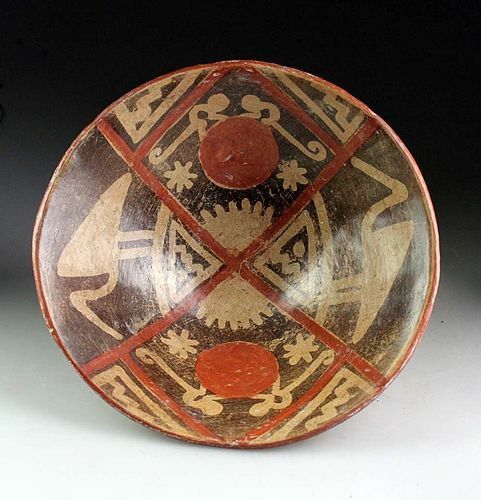 High quality Pre-Columbian Painted Pottery Vessel, Peru, Moche phase IV, c. 400-600 A.D.
Stirrup form with fine-line painting depicting wild cats, perhaps Panters or Mountain Lions. A very high quality vessel with intact colours. Size: ca. 25 cm. high Condition: Superb. Superb XXL Chinese male Ming pottery figure on lotus throne! 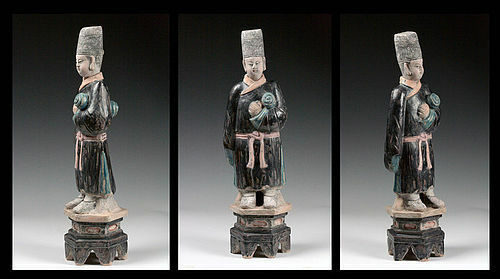 A strictly museum quality, large pottery figure of a male attendant, dating to the mid Ming Dynasty, ca. 1500 AD. The figure stands on a large Lotus throne on top of high hexagonal plint in fine Sancai colours - a two-colour blue and torqoise glazed robe. Under his arm he holds a bottle. Wonderful Islamic pottery bowl Bamiyan, Samanid Empire! 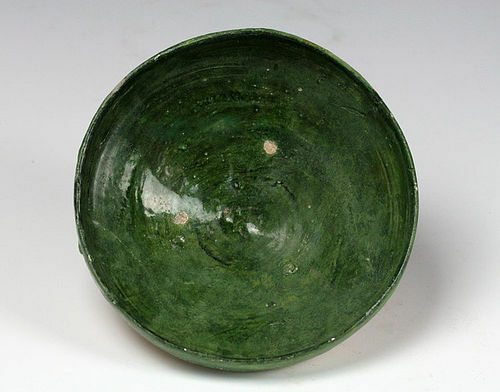 POTTERY BOWL WITH GREEN GLACE, WESTERN-CENTRAL ASIA, 10TH-11TH. CENTURY AD. A high bowl, almost cone shaped and nice for the type. Eastern part of the ancient Samanid Empire, around the Bamiyan region. Condition: Choice for type with much original glaze, hairline cracks professionally restored. Terrific shine to the glace! Ex. Copenhagen Dealers collection, aquired over a period 20 years. Pair of XL 49 cm. tall Ming Dynasty pottery figures - Male & female attendants! 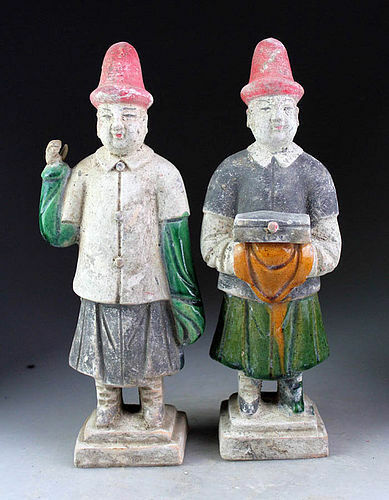 A superb quality and very large pair of pottery figures of a male and female attendants or officials, dating to the Ming Dynasty, 1368-1644 AD. The figures are standing on high hexagonal plints and wears fine robes in matching green and yellow glazes. The unglazed areas have pigmented colors in red, black and white. Finely painted facial details. A superb quality very large pottery figure of a male attendant or official, dating to the earlier Ming Dynasty, 1400-1500 AD. The figure is placed on a high hexagonal plint and wears a fine two-colour blue and turquoise glazed robe. The unglazed areas have pigmented colors in red, black and white. Finely painted facial details. The figure holds a blanket under his arm. 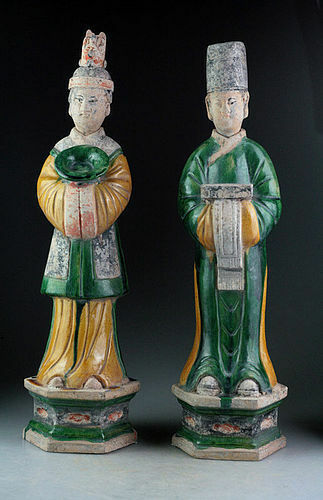 Pair of fine Chinese pottery figure of court Attendants, Ming Dynasty, 1368-1644 AD. The figures stands on a small square plints and clad in a dark green robes and a black and white coloured tunics, on their heads high red hats. One holds a small chest. The figures with finely moulded and painted facial details! A fantastic set, very decorative! Condition: Superb. nothing to remark and finely preserved glaze and pigment for types. 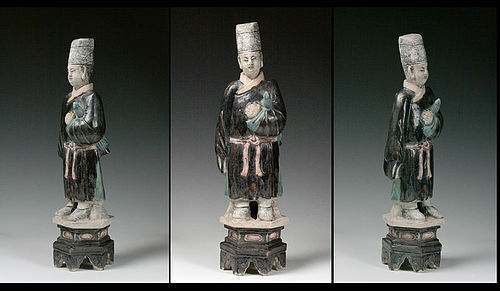 A strictly museum quality, large pottery figure of a male attendant, dating to the middle Ming Dynasty, ca. 1500 AD. The figure stands on a large Lotus throne on top of high hexagonal plint in fine Sancai colours - a two-colour green and yellow glazed robe. In his hands he is carrying a large book or box. XL 48 cm. 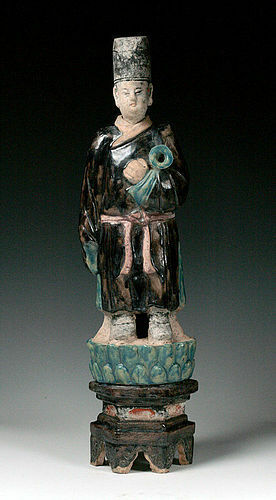 tall Chinese Ming Dynasty pottery figure! The figure holds an umbralla under his arm. XL Ming Dynasty Tomb pottery horseman, c. 1500 AD! XL Ming Dynasty Tomb pottery horseman soldier, c. 1500 AD! 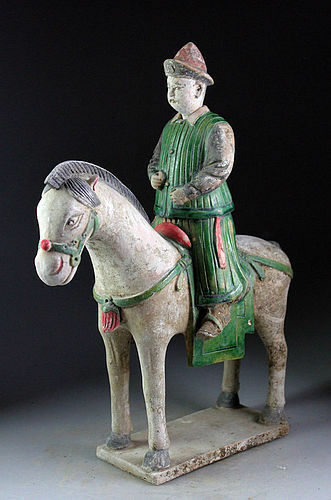 One of a group of the finest Chinese Ming dynasty pottery figures on horse in the world market today! A nice islamic pottery bowl, Western Asia, 11th-12th cent AD. The bowl is decorated with white glaze, with pseudo caligraphic decoration in black. Condition: Choice, fully intact except for a few dents. Some parts of the exterior uncleaned.